Want to connect with Camille? Hi there, If you need a Babysitter or part time nanny who is flexible and reliable then we could be a good match. 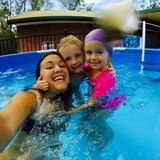 I have a lot of experience in Childcare, I have been a nanny for three little girls in Australia for 4 months. I have also babysit lots of kids in my neighborhood for 4 years. I love the outdoors and finding adventurous fun activities to do, my passions are running,swimming, writing, cooking and anything to do with art. I'm ready to start as soon as possible with an open flexible schedule. McGill student with a background in autism looking to help out a nice family!